Bathrooms are luxury personified in todays design world. The wash basin is an element which endorses this statement in the bathroom. Since the good old days of a couple of standard designs the industry has taken a total turn around and the wash basin has become a style statement in its self. While planning for a counter washbasin plan the bathroom in a way such that u can accommodate a long counter .In a counter too there are different ways to work around it you can either choose to have a counter mounted washbasin or even a counter sunk basin. Taking the counter washbasin to the next level would be to carve out the washbasin in the counter itself making it look like a single piece, this could be explored in different mediums. 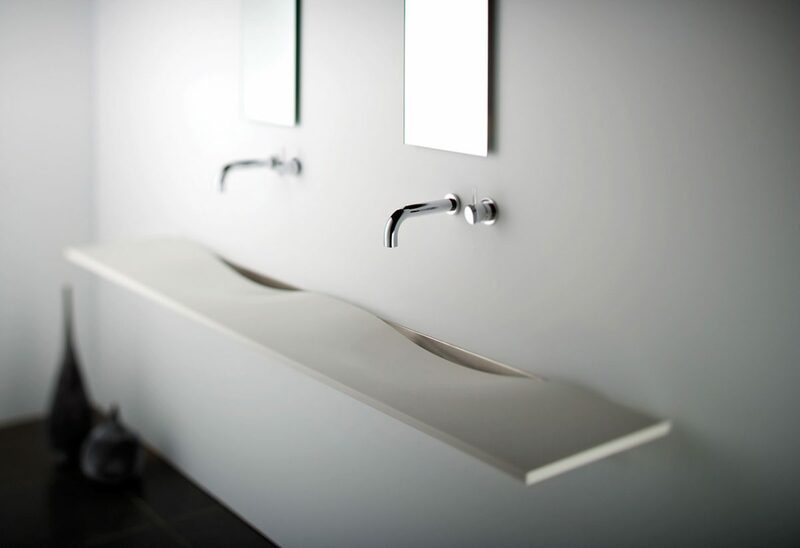 The other option is to work around with a range of free standing wash basins available from brands like Ivii, Edra. Free standing washbasins break away from the idea of conventional washbasins adds a sense of minimalism to the space. In a free standing washbasin plan for a stand alone faucet from the floor or even suspended from the ceiling to build on the idea. A free standing washbasin is more apt for a powder room where style can dominate comfort of use. Wash basins are available in different mediums like ceramic, natural wood, stone solid acrylic surfaces, marbles, copper and steel. There is no rule as to which wash basin would fit into a particular look but it be generally categorized. Though the design of the washbasin will always strengthen the overall look of the bathroom, so select the washbasin accordingly. Like a minimal styled washbasin will bring in a contemporary look to the space, while a rustic wash basin detailed in stone can add up to the feel of an earthy natural decor. Depending on the detailing and style stone washbasins fit in with ease in both contemporary as well as earthy decors the same would apply to metal washbasins fabricated out of copper and steel. Principally in a contemporary set up a minimal styled wash basin will endorse the look. In a contemporary bathroom I would like to go as minimal and would even suggest the monolithic counter washbasins customized specially for the project. Wooden bowls bring in a touch of elan these are available only at select outlets like Sameer Ceramics under a designer label of â€œThe Ashleysâ€. The wooden wash basins are hand worked on by the finest craftsmen with hand done textures which lend each piece a sense of exclusivity. The wooden bowls have been specially treated to protect them from water. The colour of the washbasin too is of paramount importance in context to the overall decor of the bathroom. The color pallet of the canvas should be either subtle so that the washbasin if highlighted or vice versa.